9/9/12 - Fundraising drive - Fontainebleau, Musée national du château - Marie Antoinette’s Turkish boudoir at Fontainebleau was created in 1777 (ill. 1 and 2). Since then its decor has been entirely preserved and will soon be restored. 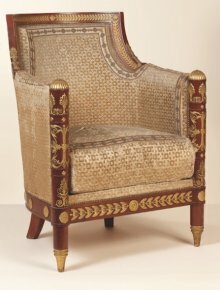 The furniture, separated and scattered elsewhere during the Revolution, was replaced by other equally luxurious pieces, produced by Jacob-Desmalter for the Empress Josephine. 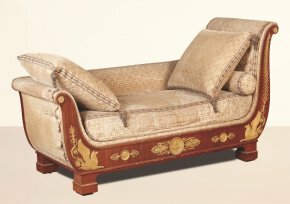 This ensemble, made up notably of an alcove bed, a chaise longue (ill. 3), a pair of armchairs (ill. 4), four chairs, a pedestal table and a fireplace screen, will also undergo a full restoration for which the château of Fontainebleau is now launching a fundraising appeal by organizing a reconstitution of this boudoir at the Aveline gallery, rue du Faubourg Saint-Honoré. This operation has set off sparks in the curator world. Some are opposed to exhibiting museum works at an antique dealer’s and the question is far from being settled. In fact, Decree n°81-240 of 3 March 1981 concerning loans and deposits to national museums forbids it. However, this decree was repealed on 27 May 2011 and was apparently not replaced . In any case, we do not find it shocking if, as is the case here, it is done for a good cause, that is a fundraising drive, especially since the gallery has temporarily transformed its façade, removing the name of the gallery so as to announce the château of Fontainebleau. Furthermore, the works are held in good conditions. We are more concerned with the restoration itself than with this exhibition since it means the fabric on the chairs will have to be replaced  (ill. 5) by an identical weaving process. There is no doubt that the colors of these silk and gold fabrics have significantly faded due to their exposition to the light, to oxidization and to the passing of time. Some of the chairs are also missing fabric in some places. What should be done : leave them in the same manner they have come down to us thus presenting an effect which is not the same as originally intended, and simply cleaning them ? Or should everything be rewoven, following the original techniques, in order to recover the same luster they had under Josephine ? The second choice has been made here, presenting serious drawbacks. First off, the cost which requires this fundrising drive. Then, the ensuing loss of authenticity which will be an inevitable result of course. 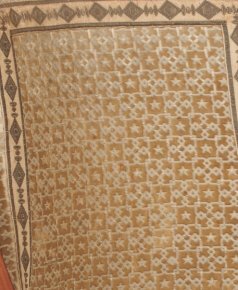 Even if the operation is carried out by the best craftsmen available, there is no way they will achieve the same quality of weaving. True, restoration principles for furniture are different than those for painting and the general aspect will be very close to the original but anyone who has seen rewoven fabrics, at Versailles for example, will soon understand that there is a parallel with the abusive restorations produced in architecture. The problem is that the furniture in the Turkish boudoir is very rare for its quality and for the fact that it retains its original fabric of that period . Indeed, there is a third solution besides the two mentioned above : there are now techniques which restore part of the original texture and vitality to the fabrics, notably eliminating the oxidization of the metals. Missing parts can also be repaired by using illusionist techniques, a bit like for paintings. Therefore, one might possibly choose to veritably restore the fabrics covering the furniture, and not opt for reweaving them. But in French château-museums, the overall effect, that is the décor, is more important than its authenticity. Unfortunately, this concern has not given rise to any kind of debate on a very fascinating question. We would like to take this opportunity to invite comments from anyone interested in opening up a discussion. Exhibition from 7 to 29 September 2012, at 94 rue du Faubourg-Saint-Honoré, 75008 Paris. Xavier Salmon and Vincent Cochet, Un parfum d’exotisme. 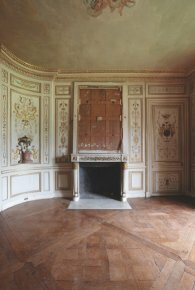 Le boudoir Turc du château de Fontainebleau, 2012, Faton ed., 64 p., 20€. ISBN : 9782878441666. We will return to this repeal soon. If this is indeed the case, we find it unacceptable that there are no regulations governing loans and deposits of museum works. The curtains closing the alcove will fortunately be kept as is. 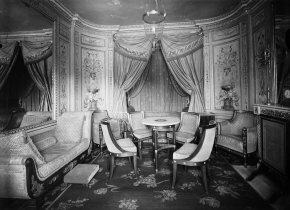 Moreover, the press release points out that : "this boudoir is the only example in the world as it is the last existing evidence of the "turqueries royales" which so fascinated France in the 18th century, with the Turkish boudoirs of the Comte d’Artois - Louis XVI’s brother - and the queen at Versailles having both disappeared."